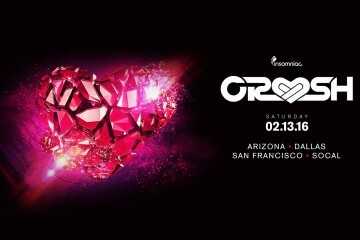 Insomniac announced the date and location details for its 4th annual Valentines-themed festival, Crush, set to take over four cities next year, including Southern California, San Francisco, Dallas, and Phoenix. On Saturday, February 9th and Saturday, February 16th, 2019, Headliners can celebrate the romantic holiday with their loved ones and friends, alongside a talented lineup of dance music artists, special décor, and captivating production, all to be revealed in the coming weeks. This past Valentine’s Day weekend, over 24,000 love-struck Headliners came together in San Bernardino, Dallas, Phoenix, and San Francisco to embrace their partners, make new connections, and dance to a soundtrack curated by some of dance music’s most notable acts. Fans reveled in the beautiful heart-shaped backdrop of the iconic Crush stage designs and enjoyed performances by amazing DJs. So we’re excited to see which DJs will play this year’s Crush 2019. Crush 2019 Tickets go on sale THIS Friday, December 7th! Details for next year’s momentous Crush celebrations can be found below. More than 20 artists will perform across the four cities, making for an enchanted weekend celebration with loved ones, old friends and new. Full show details for each location including lineups and venues can be found below.